Blue Mail Media’s Tennessee Business Database can significantly enhance your outreach to your target audience and let you to discover umpteen business and networking opportunities in the region. We maintain a huge data repository of records pertaining to businesses, key decision makers, C-Level executives, and professionals based in Tennessee. Whether you wish to connect with your prospects via email, telephone or mail, our database gives you complete access to meet the purpose. 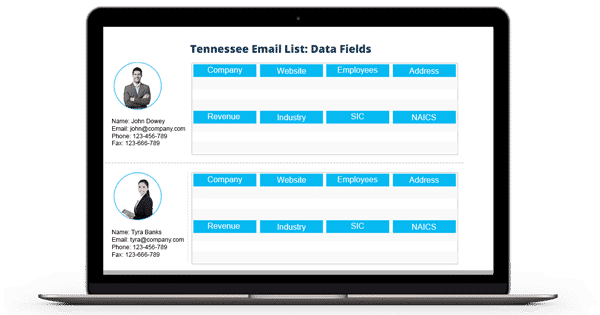 Other than the pre-packaged Tennessee Business Executives Email Database that Blue Mail Media offers, you may get your database customized to your preferred industry and region, SIC/ NAICS Code, job role, size of business, scale of operations and so on. Our Tennessee Business Executives Email List can provide you a great competitive advantage in terms of expanding your business in Tennessee and boost your response rate, conversion rate and returns on investment. Whichever industry or region you operate in, Blue Mail Media can offer you highly accurate and reliable data to execute your multi-channel marketing campaigns. Using our Tennessee Business Directory, you can be sure to achieve greater success in your marketing endeavours.